On March 10, 2016, IT professionals gathered for a night of tech, networking and beer! The place to be was 26° Brewing Company. Great conversation ensued about how the partnership between Forthright and Nutanix delivers invisible infrastructure for next-generation enterprise computing, elevating IT to focus on the applications and services that power their business. Attendees not only got to snack on delicious hors d’oeuvres, they also got to sample hand-crafted specialty beers, while networking with their industry peers. Nutanix showed us how to “hyperconverge”. They brought in a hyperconverged infrastructure for attendees to demo. They also hooked us up with some Brewtanix swag. Nothing like a good beer glass to enjoy a cold one at home! 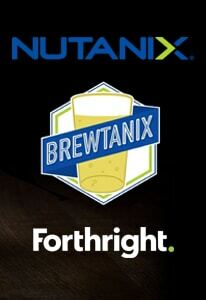 A special thanks to everyone who came out and joined Forthright and Nutanix! There will definitely be more exclusive events coming soon, so stay tuned to register. See you at the next Brewtanix event!